Take a look at the specification comparison between the Fuji XT 100 camera and Olympus10 Mark 3 camera. For we begin we all know that the Fuji XT 100 camera carry a large apsc sensor whereas the Olympus EM10 Mark 3 camera carries a micro four third format sensor which is smaller than the Fuji. Having a smaller sensor inside a camera body directly affects the image quality of the subjects. The Olympus camera features 5 Axis image stabilization system which is missing inside the Fuji XT 100 camera. 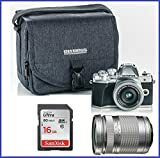 With the help of image stabilization system you will going to get more clean low light images and better videos compared to the Fuji XT 100 camera, the image stabilization has become the vital part of camera systems today and most of the mirrorless camera Does have a built in 5 axis or dual image stabilization nowadays. Now let’s talk about the auto focusing system of both the camera and why you should pick the Olympus em 10 Mark III over the Fuji XT 100, the Olympus camera offers you 121 fast autofocusing. Although the Olympus is using contrast based auto focusing Technology, despite of that the Olympus is able to focus very faster and able to track subjects at a very faster rate. Having a 121 Auto focusing system means you are getting more area under autofocusing zone that will going to help you while recording still images are getting a video from your camera. For video purpose of course we will going to recommend you to get the Olympus em 10 Mark 3 camera because the Olympus offers you to have 4K video at 30 frames per second, where as the Fuji XT 100 camera remains limited to 15 frames per second at 4K Mod which is completely unusable for me. So if you had a video guy and looking for a best entry level mirrorless camera then for sure you should go with the Olympus em 10 Mark 3 camera. Continuous shooting speed is more fast in Alam per CM 10 Mark 3 camera compared to the Fuji XT 100, with Olympus you are getting a continuous shooting speed of up to 9 frames per second where are the shau GST 100 camera the emails limited to 6 frames per second. That you are missing 3 images per second if you are having the extra 100 camera. One of the biggest reason backing up the Fuji XT 100 camera is, the large apsc sensor present inside the camera as well as you are getting more resolution compared to the Olympus e M10 Mark III. The ISO range of the Fuji XT 100 camera is bit more compared to the Olympus em 10 Mark III, you are getting one stop more ISO range, that is 51200 versus 25600 of Olympus. For still purpose I am going to recommend you to get the Fuji XT 100 camera over the Olympus em 10 Mark III. If you are a video guy or runs video blog and then I am going to recommend you to get the Olympus em 10 Mark III camera over the Fuji XT 100, because the Fuji x100 4K video mode is completely unusable for professional use.